If you are searching for Shirdi Sai Baba visit, what you should know about, what to keep in mind, what places to visit in Shirdi Temple, what instructions to follow, what are the Puja timings, you are at the right place. The Shirdi Saibaba Temple, located at Shirdi, Maharashtra, India attracts millions of devotees of all religions, castes and creed who come to pay homage to Shri Sai Baba from all around the world. The temple is a beautiful shrine that was built over the Samadhi of Shri Sai Baba. 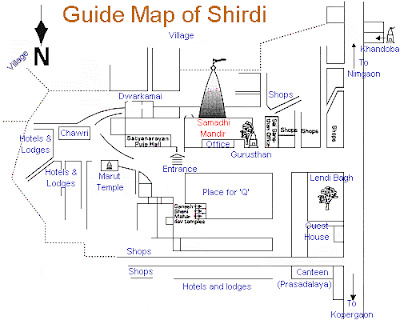 Shirdi is a small village in Kopargam taluka, in Ahmadnagar District of the Maharastra State. 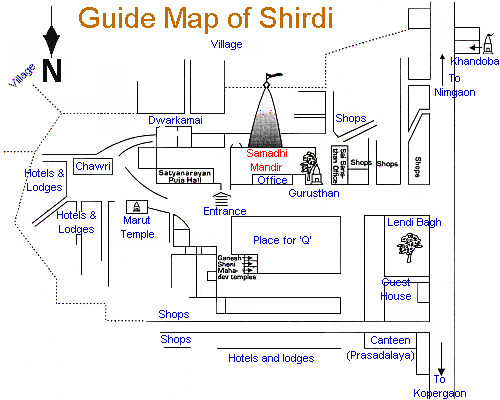 Shirdi is located about 270 kms from Mumbai (MH) and about 190 kms from Pune (MH) in India. If you are planning to travel by train, Kopargaon (KPG), Manmad Jn (MMR), Nasik Road (NK) and Aurangabad (AWB) are 4 nearby train stations near Shirdi. Important Instructions for Shirdi Sai devotees: These points I have collected after my visits to this place, and also includes family and friend's experiences. - If you have not visited this place before, make sure on arrival at Shirdi, devotees should immediately get in touch with one of the Niwassthan Office for booking of their accommodation which will be made available after registration of name and other particulars. No deposit is required for accommodation. - Sai Devotees are requested that they should not keep of their foot wears any where except Chappal stand. it is near Darshan 'Q' entrance. - Sai Devotees are requested not to carry their cell phones and cameras in Samadhi Mandir. Please keep it in lockers provided by Sansthan in Mandir Premises. - All the devotees, especially women and diabetic persons, are requested to eat some food before joining the darshan queue as during heavy rush days time required for darshan will be from 2 to 3 hours. - It would be best to keep all your belongings in your vehicle only, so you can save some time. - Thursday is the day Saibaba is specially worshipped. On this day devotees from all over India visit Shirdi for Darshan of Saibaba. - For VIP pass, only one family member need to be in queue, and now cashless (card) payments are also available. It may take more than an hour on weekdays and more than 2 hours on weekend, and important dates. - Now Online Darshan Booking has introduced for Sai devotees which are providing them an option of not standing in a queue for several hours to have darshan of Siababa Samadhi Mandir. Refer this link https://online.sai.org.in. Devotees need to be first register themselves in the Website and create an Account, after that they can select the Online services like Darshan, Accommodations, Donation, etc and make their payments online. - It was good to see that the devotees were being offered free tea/ water / coffee while they waited in queues. - As the Samadhi Mandir is overcrowded at the time of Aarti, devotees should safeguard their ornaments and purses from pick-pocketers and take care their children. - All the necessary assistance and guidance is readily available to the devotees at the Niwassthan Office of the Shri SaiBaba Sansthan Trust, Shirdi. - As the various dealers and vendors of Pooja articles are not connected with the Shri SaiBaba Sansthan Trust, Shirdi, devotees should first fix the price before buying these articles to avoid any trouble thereafter. - Medical facilities are available at the well-equipped Hospital run by the Shri SaiBaba Sansthan Trust, Shirdi. - The Laddu counter is always very crowdy. Free dry boondi also distributed in similar 50 gms packet per head. - The three main festivals in Shirdi are of two to four days each. They are Ramnavami (March/April), Guru Purnima (July),and Vijayadashami (September). - There are programme running throughout the year of puja, music (bhajan) public parayana (reading of scriptures and devotional texts) and exuberant processions with the palanquin and the Rath (cart). Make sure to visit all places within the Shirdi temple boundary. Literature about Shri Sai Baba containing authentic information in various languages has been published by the Shri SaiBaba Sansthan Trust, Shirdi at reasonable prices and is readily available at its Book shops near the Samadhi Mandir. Khandoba Mandir: Khandoba Mandir is situated on the main road. In front of this temple Baba was welcomed by Poojari Mhalsapati of this temple, who said "Aao Sai (Come Sai)", when Baba stepped in Shridi. In this temple there are icons of Khandoba, Banai and Mhalsai. Apart from these there are other nearby destinations like Trimbakeshwar jyotirlinga, Shani Shingnapur, Renuka Mata Temple, Grishneshwar Jyotirlinga, Ajanta and Ellora, Vani Saptashrungi Shakti peeth devi temple, Muktidham & Panchvati Temple in Nashik are located within 150 km from Shirdi that can be visited by the tourists here. very nice description about Shirdi Sai baba temple. visit once you have proper time, as sometimes it take 3-4 hours for darshan. thanks for helping for putting such nice information on this site. I will share with my family and friends, this site is so cool for the people visiting places in maharashtra. Thanks really nice post. Sai Baba spent 50 years of his life at Shirdi preaching his very famous epigram Sabka Maalik Ek (One God for all). I visit Shirdi twice in a year. Last time I hired a car from EO Cabs to travel Shirdi from Mumbai. It was a good experience for me. This has been the primary aim of Sri Sathya Annapoorna Trust. Sneak through our website to have a glimpse of our Annapoorna Breakfast Programme. Swami, in his subtle form, drives his devotees to work for good and quality health care for all in an unbiased manner.